La defense is located just outside the city limits to the west. It is very easy to reach as it is on the Metro, Line 1. 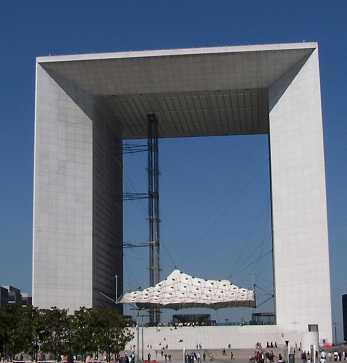 The best way to appreciate La Défense and the Grande Arche (see the photograph below) is to get out at the metro stop Esplanade de la Défence then walk up the esplanade towards the Grande Arche. 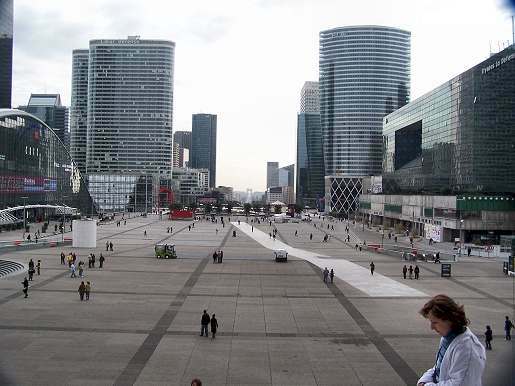 The photograph on the left was taken from the steps of the Grande Arche looking down the esplanade. From the steps of the Grande Arche you can just make out the Arc de Triomphe, and if it weren't for the haze and pollution, you would see the obelisk through the Arc de Triomphe, and past the obelisk to the Carrousel du Louvre, and the front door of the Louvre itself - some vista! The lift up the Grande Arche gives lovely views of Paris, but little else. So I'm not sure it is worth the price. Also once you are up there there is a feeling that it is not quite finished. Whatever you do make sure you have enough film in your camera. Believe it or not, but there was nowhere to buy film up there the day we went, so you pay to go up, find out you have run out of film, and that's it, the souvenir shop has no film for sale. I'm sure this must change. For me the best thing at La defense is simply the walk up the esplanade with the grande Arche getting ever bigger. I'm no fan of modern architecture, but I'm always impressed by the sheer scale of the thing. It is 330 feet high. Then after you've seen all you want, go down to the bus station (just follow the signs with a bus on them) and get the No. 73. The terminus is La defense, so you can't go wrong. It will take you through La Défence and down to the Arc de Triomphe, where you can get off and walk down the Champs Elysées, or stay on the bus all the way down the Champs Elysées to the Place de la Concorde. All for the price of one bus ticket! And there you have the Tuileries Gardens and a short walk through them will bring you to the Louvre. This must be one of the best bus routes in Paris.